If you feel your car’s AC system is not working great like before it means the AC is low on refrigerant and it is now time to get a recharge. Recharging an AC does not cost a lot and it is only required every 100,000 miles, so it is likely that you are not aware of the issue. The only way you can tell there is a problem is when you are blasting the AC in the summer and you aren’t feeling any cold. Generally, an AC recharge costs $200 or more depending on the make and model of your car if you are doing it yourself. It is a very straightforward process and usually takes 20-30 minutes. There is usually no need for you to leave your car at the workshop. However, if there is another issue associated with the AC, the repair could take slightly longer. The mechanic will charge you $150 or more but it all depends on your vehicle. The parts for the repair would cost you $100 more or less. Remember that it’s strongly advised to dry out the AC system with a vacuum before a filling of the AC system, this can only be done with an AC service station. You can do it yourself also, but the result may suffer if you are not doing it. This is one of the most important questions to answer if you do not have any knowledge about ACs. The air conditioning system in your car needs a precise amount of gas/fluid to help it function. If the correct amount of fluid is not maintained, your AC system will not function properly and other AC components can get damaged. With an AC recharge, you are letting your mechanic inspect the current level of refrigerant in the AC system and allowing him to refill the coolant fluid if need be. As long as the gas level is at the optimum level your AC will work perfectly. An AC recharge will keep your air conditioning system working in top condition. 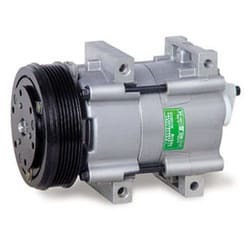 This way your AC compressor will last longer and keep your car cool and comfortable. Moreover, your AC system’s other components will also stay in top condition and you won’t need to go for AC servicing every summer. The Process of an AC Recharge? The AC technician’s first task is to check for any leakages in the AC piping. In other words, the technician needs to find the core issue in order to make an effective repair. If your air conditioning is not working properly there can be an issue with a number of AC components, so the technician will check the whole system just to make sure. If the AC is recharged without checking for the source of the problem, the problem would reappear. However, after checking the entire system if the technician decides a recharge is what your car needs then the first thing he will do is extract all the liquid from the system. A coolant recovery machine is used to extract all the refrigerant at once without it leaking into the air. As soon as all the coolant is removed from the AC system, the technician will remove all the air from the system, and then proceed to refill the coolant. Finally, he will seal the AC system and check its potency. Always check the label on your car for which AC fluid you should refill your car with. The most common one is R134a if you have a newer and R12 for the older cars. Nowadays, there are R1234yf in newer cars also, so you should be aware of that. When Should You Get an AC Recharge? If your AC is not working properly, you need to get a recharge. However, recharging is not needed immediately. You can use the AC for some time before it absolutely needs a recharge. If you are delaying the recharge for too long, you might damage other AC components such as the compressor, which is expensive to replace. The AC system should maximum loose around 10-20 gram per year. There is around 500 g of AC fluid in your system from the beginning, depending on the car model. If you have noticed a higher amount leak, inspect for any leaks! If the cold air from your AC is reducing gradually then that means the refrigerant levels have gone low naturally. However, if there is a sudden fall in the cooling ability of your AC, it is more likely that you have developed a leak or two in your AC system. These leaks need to be filled before the new refrigerant is added. Look out for weird sounds coming from the AC. If there is an audible noise coming from the hood, it means your compressor is almost empty of coolant. No matter how much you like it or how much you are able to, never try to recharge your AC by yourself. 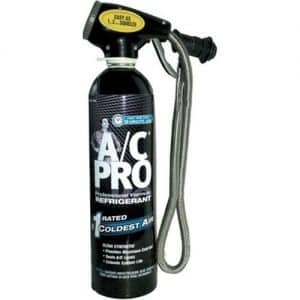 The refrigerant that is put inside an AC is flammable and can easily cause an accident if used unprofessionally. You should always let your mechanic do the job for you as even the slightest miscalculation can result in grave consequences. Therefore, you should never take an AC recharge as a DIY job. Do not save money in this regard and always consult a certified technician. The only way you can save a few bucks is by comparing the prices of the various technicians in your area. You might not be able to save a lot but a good deal might prove to be fruitful in the long term. The equipment used for recharge is usually readily available at an AC technician’s workshop. You cannot save money by bringing your own, so do not try to be over smart. The amount of money you spend on a recharge can depend on the make and model of your vehicle, as we have already ascertained. But how much can the costs differ from vehicle to vehicle? Let’s find out. If you are driving a large vehicle like a Ford F-150 truck you can expect to pay from $120 to $170 for labor and $80 to $130 for the parts. That takes your total costs over $200, however, you can expect a maximum price of $270. For a sedan like a Nissan Altima, you can expect $250 maximum. It should be clear by now that an AC recharge would not cost you more if you have a large vehicle. Usually, the compressor used in all vehicles is typically the same size. But if you are faced with a leak you might have to pay extra money. Here the size of the vehicle comes into play as the piping is dependent on the size of the vehicle.